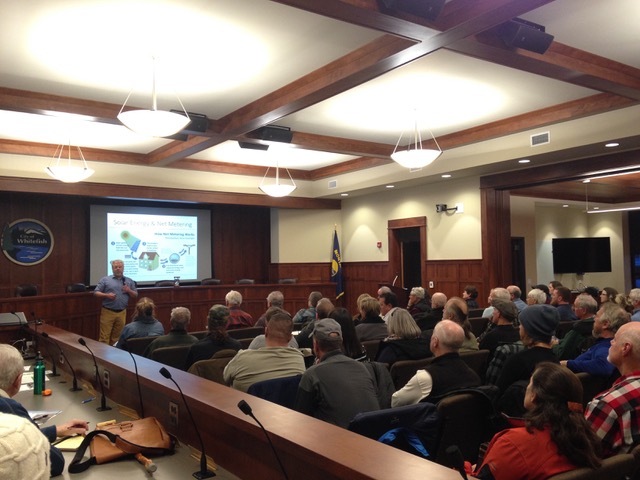 An enthusiast crowd packed Whitefish City Hall last night to learn what it takes to go solar in the Flathead. They met with local solar installers, financial and policy experts, and representatives of Flathead Electric Cooperative. Montana’s high solar potential partnered with a 55% drop in prices over the last five years has contributed to a quadrupling of statewide installed solar capacity over the last year alone. However, despite high potential for generating homegrown energy, Montana is only ranked 40th in the nation in installed solar. Residential solar is on the rise, but the residential solar landscape can seem confusing and difficult to navigate. For those who attended the Solar-Ease Workshop, the solar landscape is a lot less confusing now. Andrew Valainis, Montana Renewable Energy Association, discussed Montana’s solar landscape of policies, cost variables, system options, and statewide trends. He discussed the SolSmart program in which local communities are certified as solar-friendly. 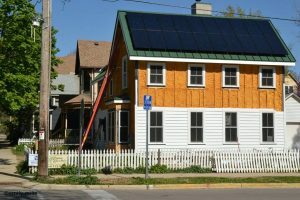 Whitefish is on track for certification through this Department of Energy program along with the cities of Red Lodge, Missoula, Helena, Bozeman, Great Falls and Missoula County. Bryan von Lossberg, a renewable energy consultant, discussed the nuts-to-bolts process of going solar, including pricing data and trends, how to select a contractor, and how to choose a system that works for you. He displayed data to demonstrate that solar is indeed a feasible option in the Flathead Valley. Paul Herendeen from Missoula Federal Credit Union went into detail about financial considerations and financing options. He analyzed the return on investment (ROI) for a 5kW system, such as shown in the photo below. His analysis estimates ROI of 3.7% annual return in the Flathead, a higher rate of return than the bond market and a lower rate of return – and a lower level of risk – than the stock market. This rooftop solar system provides 5kW of renewable energy.